Have you noticed the small statue of a woman, her hands held together in prayer, standing inconspicuously in a niche on the third floor of Falvey? Who is she and why is she in the Library? Is she a patron saint of students or libraries? She is the only statue in Falvey; she must be important. A closer look at the figure shows a plaque on the base of the sculpture: “Dedicated May 16, 1968, in honor of Mr. & [sic] Mrs. Albert K. Fischer on the occasion of their 25th wedding anniversary. For those I love so much in a place I love. Alan ‘68” This tells us the first name of the person who donated the statue and the occasion, but there is more to discover. With the help of the Alumni Office, this writer was able to contact Alan Fischer ’68, who generously shared the following information: “I have always had a great devotion to the Blessed Mother and a deep love for my parents. Consequently I saved for four years at Villanova to purchase the statue as a way to thank them all for the help I received to get through Villanova.” Fischer’s graduation from Villanova University coincided with his parents’ 25th wedding anniversary, and they are the Mr. and Mrs. Albert K. Fischer named on the plaque at the base of the figure. To have the statue made and then donated to the Library, Fischer first contacted the Rev. Richard Appicci (1928-2007), OSA, a professor of religious education and, from 1965 until 1967, the Vice President of Student Affairs. Father Appicci put Fischer in touch with the Rev. 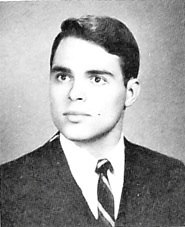 Henry Syvinski (1919-1999), OSA, artist, faculty member and adviser to various student organizations. Father Syvinski sent Fischer to the Rev. Louis A. Rongione (1912-1980), OSA, who was library director at the time. 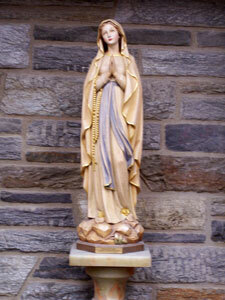 The Falvey statue of Our Lady of Lourdes is a small (approximately three feet tall) painted wood version of the large statue which stands in a niche at Lourdes, France. 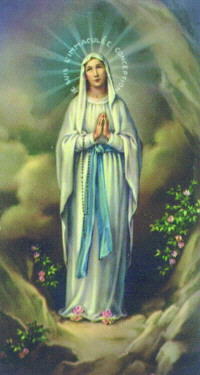 She wears a white robe with a blue sash and a long white veil. A golden rosary hangs from her right arm and a golden rose adorns each foot, just as we see on the original statue at Lourdes.